The Kitchen Hop returns and this time it’s taking over Coral Gables. Zevents has taken the Foodie Crawl to Miracle Mile. On Saturday, August 23rd from 2pm-6pm foodies can jump around from kitchen to kitchen to enjoy savory appetizers and entrée along with specialty cocktails and $3 Beer specials from your favorite spots in the Gables. 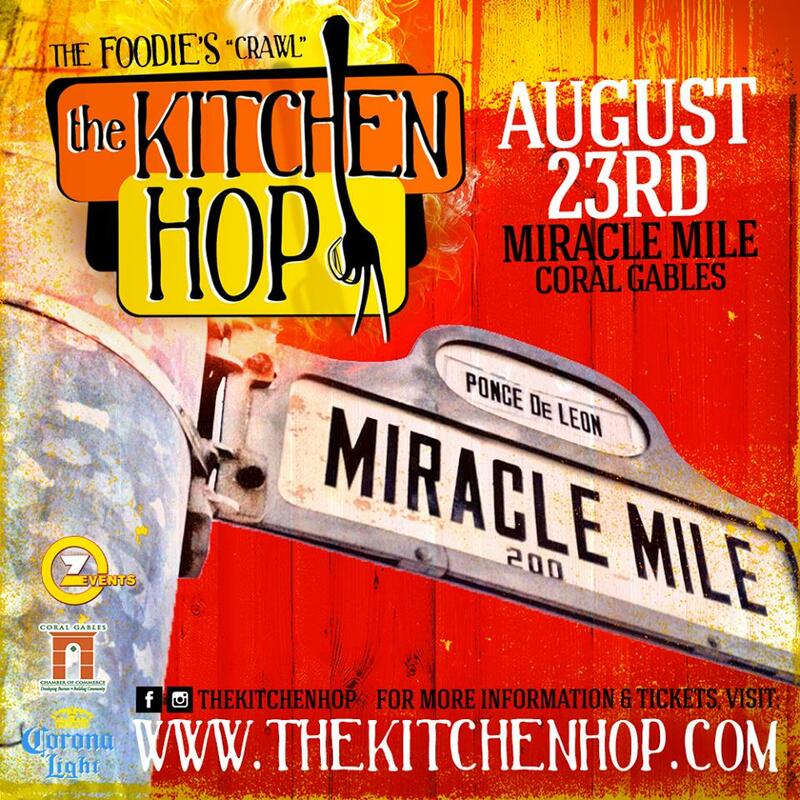 More than 10 of the area’s best kitchens will be participating in the first Kitchen Hop-Coral Gables Edition! Once you’ve tasted your way around the Gables, get ready for some dancing as you make finish off the night with an after party at Cibo Wine Bar and enjoy a complimentary welcome cocktail. Participating restaurants include: Seasons 52, Cibo Wine Bar, Burger Fi, Mortons Steakhouse, Bulla Gastrobar, Bricktops, Red Koi Sushi, Fritz and Franz Bierhaus and more to come. To keep you going through the afternoon of feasting, Vicky Bakery will be providing a “Cafecito Corner” for all those in attendance. Don’t miss the first Kitchen Hop Coral Gables Foodie Crawl. Tickets are available online at www.thekitchenhop.com and use Promo Code:“Zevents” to save 50% on your Kitchen Hopper Ticket!